Every year Tampa draws in a crowd of over 300,000 people for its annual Gasparilla celebration on the bay. While there is a lot to see at the main parade on Bayshore, what often gets overlooked are the over 100 pounds of beads and 24 tons of garbage that is left behind after the celebration. 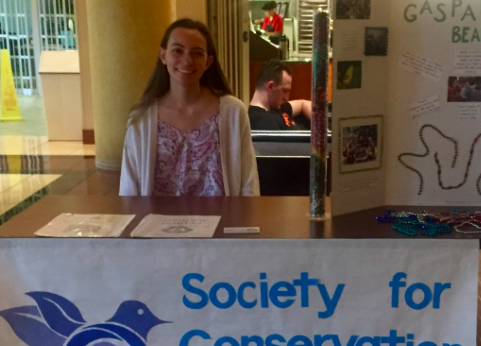 “[This year] we’re putting bins in residence halls and we will be tabling in Vaughn to collect all the beads,” said Sarah Noonan, a sophomore biology major and president of the Tampa chapter of the Society for Conservation Biology. Within the organization, Noonan coordinates volunteer work and has spearheaded the new bead recycling initiative on campus where students can dispose of their beads they collected instead of throwing them out. Once all the beads are collected Noonan will donate the beads to be reused for next year, and the broken beads will be donated to TerraCycle who will recycle the beads properly. Christina Arenas, environmental program manager for the organization Keep Tampa Bay Beautiful, said that in preparation for Gasparilla the city installed grates on the storm drains to prevent debris from going into the bay, and it also placed recycling and trash bins along the parade route for proper waste disposal. According to a report by the Tampa Bay Times the cleanup effort for Gasparilla will cost the city $35,000 in overtime pay to employ city workers to cleanup the garbage left behind by attendees. “Each year the city needs the help from people on land and on foot to remove the debris that the large clean up trucks cannot gain access to,”Arenas said. This year, Keep Tampa Bay Beautiful had about 300 volunteers sign up to help clean up the city after Gasparilla. While there have been many instances of Gasparilla cleanups and recycling programs on land, there is still a big area of Tampa that has been left untouched: the Hillsborough River and the bay. “Even though I was having a ton of fun at the parade I remember thinking to myself that this is right by the river and I was sure a lot of trash and pollution was getting into the river,” said Ally Marter, a junior environmental science major. Marter said it really hit home, when she and 20 other divers went into the river last year and picked up over 100 pounds of beads from Gasparilla in under two hours. “It was super eye opening for me and I can only imagine further up the river how many more beads a trash there are associated with Gasparilla.” Marter said. Marter said that she plans to participate in another dive into the river this year which will take place on the first weekend in May of 2018. “There’s not much left the city can do,” Arenas said. “It is up to us as a community to do our part,” Arenas said. Fallon Fisher can be reached at fallon.fisher@spartans.ut.edu.